First and foremost, summer, beautiful summer is here. And although we had a couple of brutally hot days, the weather has turned delightful—warm and sunny during the day and cool at night. Despite the sometimes stifling heat, I love this time of biking, patio days, and flowers. 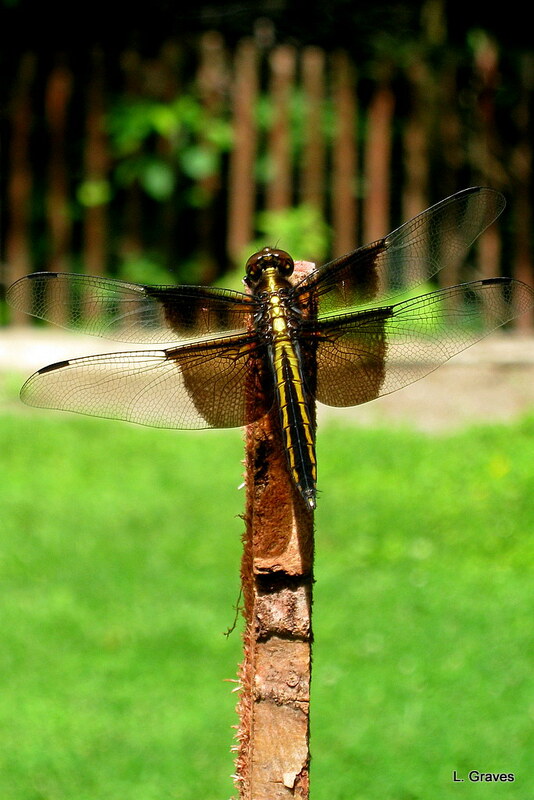 Second, the dragonflies are here, and they have come in squadrons, zooming, zipping, and nearly hitting us as we bike. But those daredevils pull up at the last minute. They are expert pilots, and it makes me laugh just to watch them dip and dive. The fact that dragonflies eat lots and lots of mosquitoes makes me even more grateful for their arrival. Welcome, welcome, dragonflies! 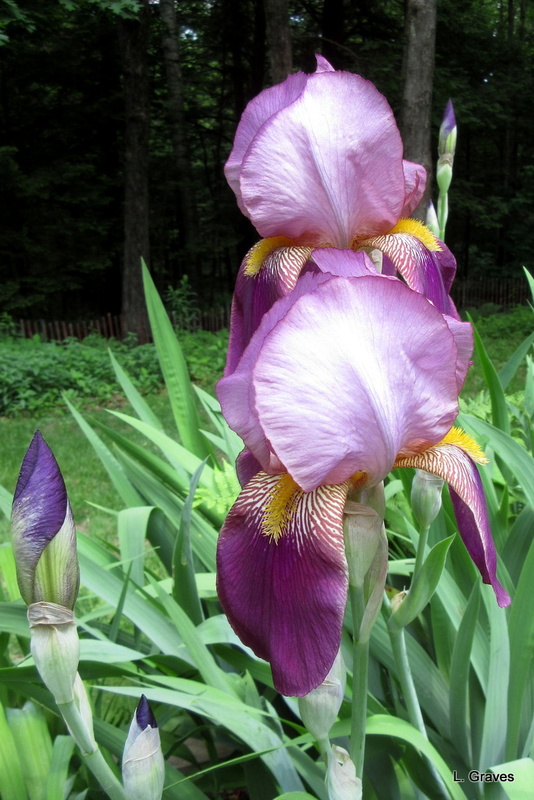 Third, when irises are in bloom, I am always grateful, and right now my irises are abloom. They are gone too soon, but while they are here, how I love them. I know. I’ve featured them in previous posts, but I just can’t help myself. 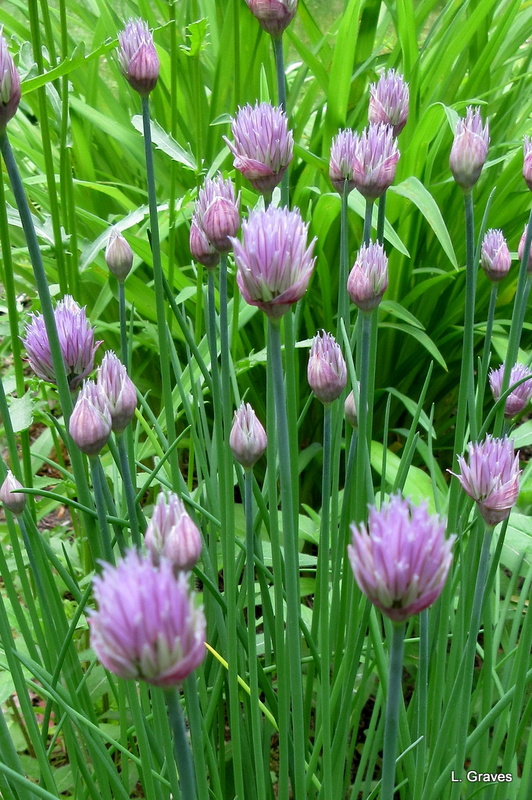 A bonus: Chives, because you can never have too many flowers. Previous PostEliza’s BeautyNext PostHappy Birthday, Meridians! Great dragonfly closeup and lovely iris, which one never tires of seeing! Funny – people really do rave over their iris – I must get me some! Lots to rave about when it comes to irises. Such a beautiful flower. The detail on the dragonfly wings is amazing. Thanks, Beth. That shot was taken by my previous wee wonder of a camera. Those little cameras are something else! Lovely that you have so many dragonflies – they are amazing creatures. I’m also very fond of chive flowers… as are the pollinating insect that it’s so important to care for. Oh, how l love watching dragonflies zip and dive and fly. Lots of buzzing insects in my gardens. Beautiful photographs, Laurie! I definitely agree with all your choices today! Summer is definitely here as well. I’m glad, though the weather has been less than delightful – very hot sometimes, and very humid always. Great dragonfly pic – haven’t seen them here as of yet. But we have seem some fireflies! Fireflies! Not in Maine, yet. But soon. Oh, that dragonfly! What a fabulous picture, Laurie!